The number of articles retracted related to nutrition now numbers unlucky 13 - and that bad lack shares one name in common: Brian Wansink, Ph.D.
Today, the JAMA organization retracted six more. The big question you will likely ask is, where was peer review? Well, peer review was never great and this shows why. Peer review was not even important until the 1980s when academics, hungry for more government funding and the appearance of "independence" they believed it brought, came up with peer-reviewed journals as the way to show academics were doing something useful with taxpayer money. "Publish or perish" culture, which had existed for a few decades in nascent form, became a Golem. In the case of Wansink, they passed peer review precisely because it was psychology. Who can replicate a survey of psychology undergraduates (basically, almost all psychology papers) and expect to get the same result? Who can replicate a paper claiming you will snack more watching an action movie and declare their results superior to what Wansink did? It's all made up. 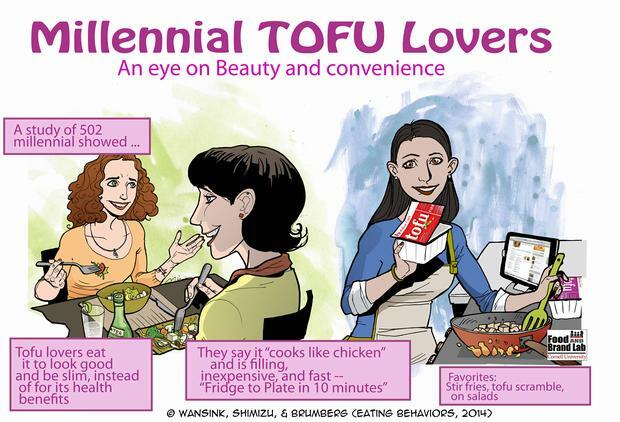 Why millennials eat tofu. It was published here. Why? Because it looked just as legitimate as any claim made by Marion Nestle or Naomi Oreskes about food. But I noted years ago that young psychologists were going to shake the pillars of heaven when they discovered that their elders were just throwing nonsense around. They were going to rebel when what they thought was going to be science was instead a network of academics wanting them to play the game and line up at the trough. And they did just that, killing the careers of Dirk Smeesters and Diederik Stapel and others when they were shown to have "irregularities" in their published work. And it happened in nutrition also. A small cadre of early career scholars expressed concern about the work of his lab and it caught attention when they then found 150 errors in just four papers. The Joy of Cooking got retribution for him claiming their book made people fat, political hatchet sites like Undark dutifully did some churnalism by repeating their friends at Retraction Watch. Dr. Aaron Carroll used it as a good discussion point. But the biggest concern came after former graduate students said if they found nothing interesting in data, he would tell them to create a new hypothesis and try again. P-hacking, HARKing (hypothesis after the results are known) and data dredging are a no-no outside the activist community (where it is unfortunately common). It is popular in corporate media, but anything that will bring eyeballs is. But it rarely gets mainstream attention. Wansink has tenure, he is not going anywhere, but now that young scholars have found that they can make their bones exposing fraud to the light, how long will it be until dozens or hundreds of papers produced by the Harvard T.S. Chan School of Public Health, using so many columns and rows they are guaranteed to statistically link some food to some disease or benefit, are brought down as well?